This represents one animation. It points to different faces. Definition at line 26 of file face.h. The actual faces for the animation. Definition at line 31 of file face.h. Referenced by CREUtils::animationNode(), CREAnimationControl::display(), esrv_send_animation(), init_anim(), map2_add_ob(), CREMainWindow::onReportDuplicate(), CREFacePanel::setItem(), and CREAnimationPanel::setItem(). Definition at line 29 of file face.h. Referenced by apply_anim_suffix(), CREAnimationControl::display(), and init_anim(). Name of the animation sequence. Definition at line 27 of file face.h. Referenced by add_abilities(), anim_compare(), CREUtils::animationNode(), apply_anim_suffix(), apply_changes_to_player(), cfapi_object_get_property(), init_anim(), ResourcesManager::load(), CREMainWindow::onReportDuplicate(), CREAnimationPanel::setItem(), and try_find_animation(). Where we are in the array. Definition at line 30 of file face.h. 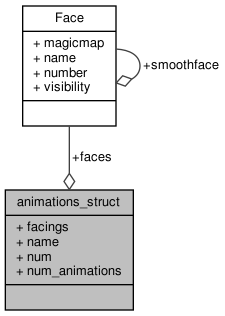 Referenced by init_anim(), CREAnimationPanel::setItem(), and try_find_animation(). How many different faces to animate, size of the faces array. Definition at line 28 of file face.h. Referenced by CREUtils::animationNode(), apply_anim_suffix(), CREAnimationControl::display(), esrv_send_animation(), init_anim(), CREMainWindow::onReportDuplicate(), CREFacePanel::setItem(), and CREAnimationPanel::setItem().